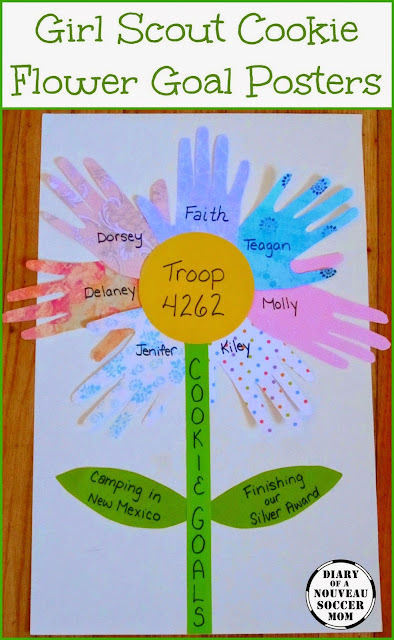 It's almost cookie season in Colorado, our cookie rally is actually tonight, and Faith and I are still crafting for cookie booth ideas! This year, our Cadettes are running the cookie rally and Faith is making Girl Scout Cookie Goal Flower Posters at her station. We think these will be awesome keepsakes for each troop as a cute booth decoration. Even better, they are very easy to make. We've seen so many beautiful ideas out there, but we wanted to create ideas that are doable for all troops, of all crafting abilities. 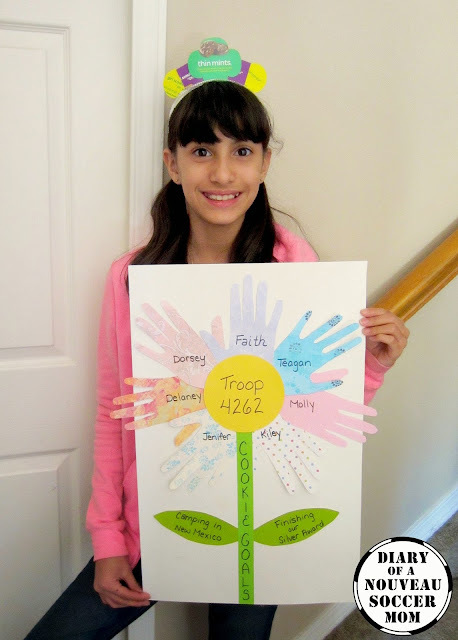 Precut the colorful scrapbook paper into 6 inch squares and pass out a sheet to each girl. Have them trace their hands on the paper and cut them out. Let the girls write their names on the palm of their cut-out hand. Cut a 1 inch strip from the green card stock for the stem, then two leaves from the same paper (I freehanded these), and a circle from the yellow card stock. 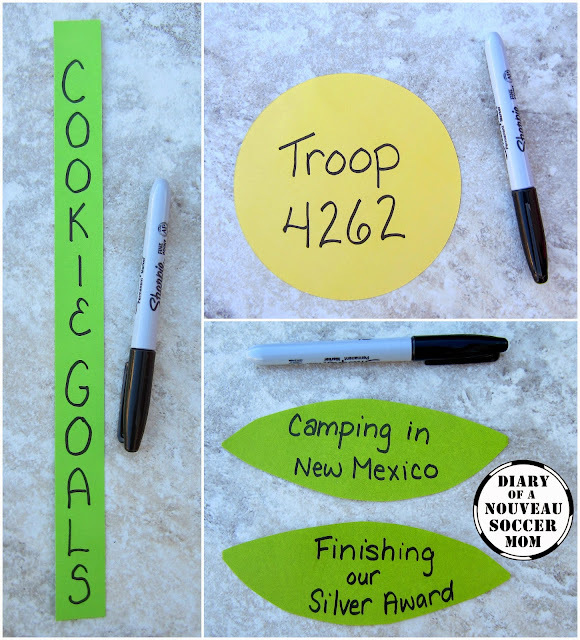 Have the girls pick two cookie goals for the leaves and write them down, along with the troop number on the yellow circle and "Cookie Goals" on the stem. Glue the lower half of the stem down on your poster board, then tuck the tips of your leaves under it and glue them down. 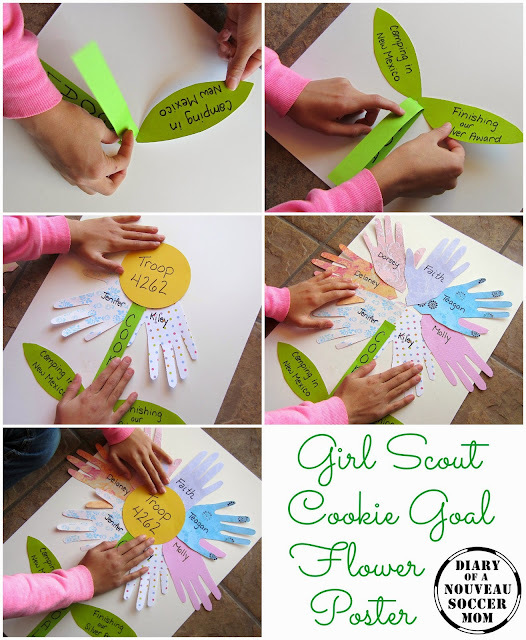 Carefully arrange the hands to make petals, and glue each one down in turn. We measured against the yellow circle so all the names would show. Once the hands are arranged and affixed to the page, glue the rest of the stem into place, then glue the yellow center on the very top! Want more great Girl Scout Cookie Booth ideas?